Finding a new flatmate can be daunting process which isn’t made any easier by the fact it comes with time constraints—unless you’re ok with forking out for the entire rent. It can therefore be easy to rush the whole process in an effort to get it over with. However, it’s important to take your time and ask the right questions—at the end of the day the person you choose will be living under the same roof as you. Some of these questions can be asked prior to inviting a potential flatmate over for an inspection of the property, while others may be best suited for further down the selection path. This question can be useful in covering the all too important, but sometimes crass topic of “can you afford the rent”. The question can help identify if they are employed and what they do for a living, or, bring to the fore how they will pay for the rent. It’s important to remember that those who are not employed full-time have other means of paying their rent be it through part-time work, government benefits or scholarships, so don’t immediately discount someone who says they don’t currently work full-time. Handily, the question may also uncover if your flatmate and their field of employment will bring any new perks or talents to the home. While there is no specific ‘art’ to living with others, experience can sometimes make a flatmate more attuned to the subtleties of co-habitation. It’s likely they’ve already experienced the frustrations and joys of sharing bathrooms, kitchens and living areas with others which could make their introduction to the home smoother than those without. Someone who hasn’t lived with others shouldn’t be a deal breaker, however, but it will give you an expectation that there might be a short teething period. Particularly someone who has previously been living alone. Even if your potential flatmate’s reasons for leaving their previous home were negative it’s unlikely they will be forthcoming with these facts—so expect a mostly positive response. However, there can be some things to listen out for, particularly if you feel they may meet the same challenges in your home. Remember, you’re not just picking someone who suits your home, but also ensuring your home suits the person you pick. If you’re sharing a bathroom with the new flatmate, knowing what time they get up or need to be at work can be handy in determining if there will be a morning clash. Adding a new flatmate to the already busy 7–7.30am bathroom rush could see you leaving the house later than you want. It will also identify if the applicant works shifts, which can be positive or negative depending on the current flatmates. The good could be less strain on the morning bathroom rush or on the evening kitchen crush, while the bad could be someone up-and-about the home during the night or early morning. 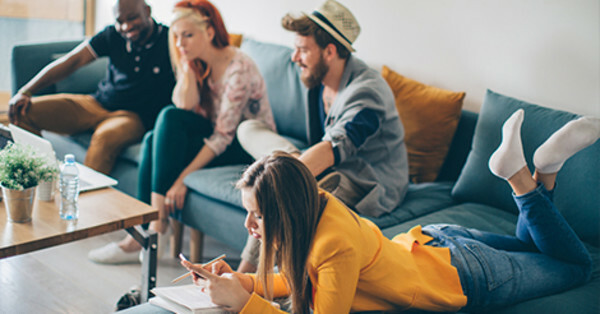 Identifying commonalities with a new flatmate, even one as simple as a TV show, can help create a bond and offer opportunities to socialise. A Monday night viewing of Game Of Thrones, for example, not only gets the household together, but presents a conversation piece for the week following. This question will may also identify if the potential flatmate has terrible taste in TV, thus spending their days in the house hogging the lounge room while they digest their shows alone. The question doesn’t necessarily have to be about TV, but can be changed to suit the interests already shared by the home such as cooking, sport, the arts etc. Finding out what a potential flatmate does on a typical weekend is a good way to decide if they will fit the house vibe. Some flatmates are home-bodies and others seem to never be home, and only one type may fit your home. If you’re a social, for example, and enjoy people around the home often the homebody could be a good bet. On the other hand, if you enjoy the place to yourself on a weekend, having a flatmate who enjoys being out could be better. This type of question can also help indicate if they enjoy having friends over on the weekends or if they like to go out to meet people.